Mumbai: The rupee’s movement against the US dollar will be one of the primary factors that will shape the performance of the Indian economy in the new year. A weakening Indian rupee will inflate the cost of oil imports, posing an upside risk to the country’s fiscal deficit. Costlier imports will further stoke inflationary pressures in the economy. Much of the rupee movement will depend on how the European crisis unfolds and capital flows into the country, according to currency dealers and economists. The economic crisis in Europe, led by concerns of a debt default by Greece and the downgrading of two French banks, has led to a loss of confidence in the euro, resulting in its depreciation against the dollar. This has also led to the dollar appreciating against other currencies including the rupee. If the crisis continues to fester, the demand for dollars will shoot up, further weakening the domestic currency. “We are bearish on the euro, which means the dollar will stay strong and this will weigh on the rupee," said Phani Shankar, head of financial markets at ING Vysya Bank Ltd.
Mint’s Anup Roy discusses the impact the weak rupee will have on India’s economy in 2012. The rupee has fallen around 16.5% against the dollar since July. The drop is seen as being triggered by an acute shortage of dollars in the forex market due to an outstanding payment to Iran towards oil bills. Then, the euro zone crisis forced investors to withdraw investments from India and invest in safe havens such as US treasuries and dollars. 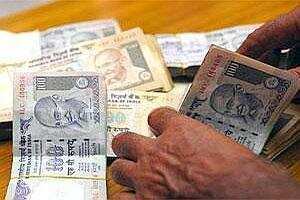 “Capital flow will be extremely important and the rupee level will be a function of that. Our view is that the balance of payments (BoP) will remain in deficit mode next year unless there is a large pick-up in capital flows," said Shankar. External borrowings that are maturing in the next six months will put pressure on the exchange rate. According to Reserve Bank of India (RBI) data, as of 11 June, $137 billion in short-term debt obligations to foreign creditors is to be met by June 2012. This includes deposits from non-resident Indians (NRIs) and $20 billion of external commercial borrowings. The debt will put pressure on the rupee as dollars will flow out of the country to meet these obligations. Standard Chartered Bank does not see the Indian rupee appreciating on a sustained basis until economic growth starts accelerating. “Hence, rupee losses are likely to resume in early 2012 as the BoP stresses persist due to choppy portfolio flows and potential debt redemptions," Standard Chartered Bank wrote in its currency report. Still, economists and currency dealers do not see RBI letting the rupee depreciate sharply from current levels and this will send a strong signal to exporters who are reluctant to sell their dollars in the market. “Once exporters see the rupee level not depreciating much from the current level, they will start booking in the forwards and sell dollars in the spot market. That will ease the pressure considerably and this is possibly what will happen in the coming months," said Harihar Krishnamurthy, head of treasury at FirstRand Bank. To attract dollars to the country, RBI also deregulated the deposit rates of NRI accounts and let the banks fix the interest rates. Since then, the rates have jumped from around 3.85% to 9.5% as banks compete to attract the money of high networth Indian individuals overseas. In the short term, this will ease the dollar liquidity pressure. Amol Agrawal, an economist at STCI Primary Dealer Ltd, said in a research note that while the rupee depreciated by nearly 20% against the dollar from April to December, in terms of real effective exchange rate—that compares with six major currencies of the world—the depreciation has been 10.44% between April and November. During the crisis that followed the September 2008 collapse of Wall Street investment bank Lehman Brothers Holdings Inc., the depreciation was at 9.3%. “Domestic and global conditions are indicating that the downward pressure on the rupee will remain," Agrawal said in his report. “RBI is likely to continue its policy mix of controlled intervention in forex markets and administrative measures to curb volatility in the rupee. Apart from RBI, the government should take some measures to bring FDI (foreign direct investment) and create a healthy environment for economic growth." The pace of the rupee’s depreciation, too, is unlikely to be as sharp as witnessed in the second half of 2012 due to limits on speculative activity imposed by the central bank recently. “We expect rupee gains to accelerate in H2-2012 as local fundamentals improve, capital inflows pick up, and a better risk environment weighs on the dollar. As such, the rupee is likely to outperform regional currencies in H2-2012," Standard Chartered economists Priyanka Kishore, Samiran Chakraborty and Anubhuti Sahay wrote in a report.